Sekumpul Waterfall is one of Bali’s most scenic natural attractions. The waterfall is actually a cluster of six to seven narrow cascades that form the centre piece of a lush green bamboo forested valley. 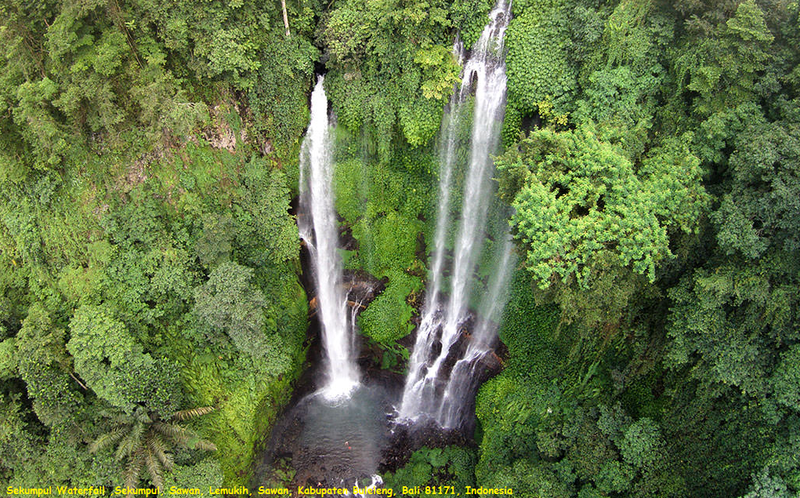 You can reach the falls on a nature trek through the namesake village of Sekumpul, which is located in upland region of the Buleleng regency in North Bali. The village is within an hour’s drive southeast from Lovina Beach. The falls are fed by two upland streams, and is the most accessible of the collection of falls in the area. Even so, getting down here requires a good deal of effort, with paths comprising dirt tracks, a hundred or so steps and crossings over streams. There are two ways you can enjoy the falls. A trek leads you to purpose-built gazebos where you can cool down and catch your breath while enjoying the view of the 80m-tall majestic fall from a distance.